Our current projects are summarised in our Sustainable Neighbourhood Action Plan - Summary. Use the contact form to find out more and get involved. Join us for a series of 30 minute workshops, run by local experts, to share skills and knowledge amongst neighbours. Participants will learn about saving money, sustainable living practices, caring for the environment, preparing for natural disasters, and more! Do you love your beautiful bushland surrounds? Help us make it even better! Join us for a planting day, learn how to create a backyard habitat, or help us maintain and improve our beautiful bushland. Art is a fun way to connect people and communicate a message in a different way. 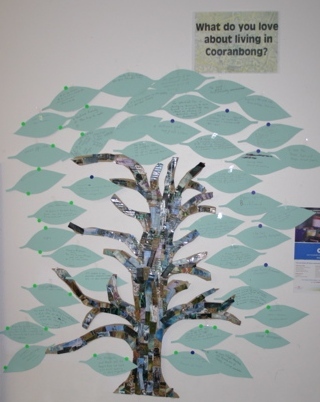 Join us and use your artistic skills to create an artwork, photograph, or poem to express what you love about Cooranbong. Meet your neighbours, celebrate, and socialise through group activities and informal get-togethers.